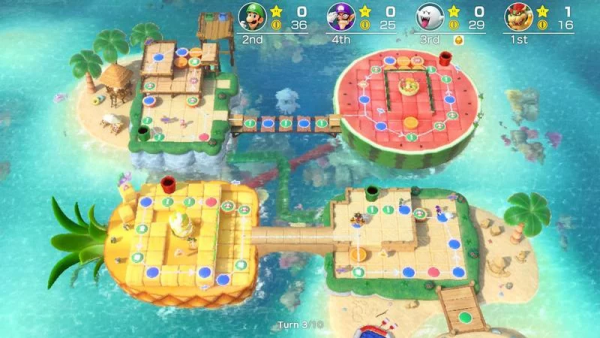 I have always enjoyed Mario Party games, even during the tough times for the series like *cough* Mario Party 10 *cough* which had some fun mini-games, but the competitive nature from the originals was absent with the mechanic that had you and your opponents all travelling together across the boards. It seems that the team have learnt their lesson this time and have given us classic board games, but is it a case of being careful what you wish for? The roster of Super Mario Party has increased dramatically from past games, this time even letting you play as Bowser and Bowser Jr, which means the demise of Bowser Spaces, but Kamek makes up for these will similar blocks that will make you scream at the Switch. The boards are a bit smaller than we’re used to and the price of Stars is only 10 coins, which makes it more a race to the spot as opposed to those who earned enough in mini-games, which is my only real complaint with the boards themselves. I would have liked to see more than a handful though, but would really welcome some DLC here. Mini-games are a collection of button-mashing, puzzles, memory games and races. Some of which require motion controls from your Joycon controllers, I have to mention at this point that Super Mario Party requires you to play with the Joycons only, so the Pro controller is a no-go. The good news is that the motion controls work really well and if you lose, you can usually only blame yourself. The only aspect of the motion control that I despise is River Survival that requires you to use the Joycon to paddle a boat down a stream. The mini-games you come across are good fun, but paddling for a long period is not. Besides typical Mario Party and River Survival are other modes like Partner Party that lets you team up with one player in a 2v2 scenario that is harder than it seems, but good fun nonetheless. Sound Stage is a motion-control series of mini-games where you need to keep in time to the beat…and considering I have no rhythm of any kind, it wasn’t my favourite. Toad’s Rec Room does things differently with mini-games that make use of more than one Switch screen, but I was unable to test this due to the lack of a second Switch and second copy of the game, but it sounds fun. Challenge Road becomes available after all mini-games have been unlocked and is a single-player battle to the finish by playing each mini-game with specific requirements to beat, including higher difficulty opponents or other ways of actually winning. Finally we have Mario-thon, which is more of a mini-game tournament that you can set up against friends and AI, but there’s also an online mode of this which naturally requires the new Nintendo Online service to play. It’s great fun, although playing the board games online would have also been neat. 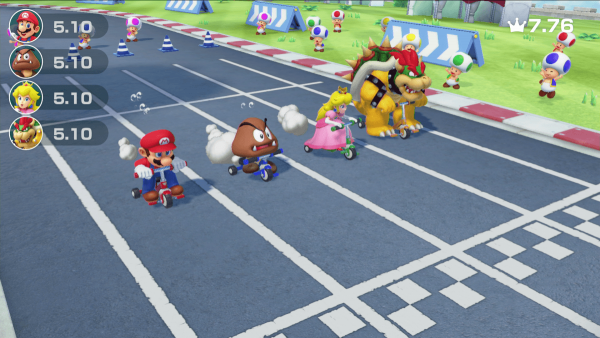 Visually, Super Mario Party makes good use of the Switch’s power and at times, looks amazing. There’s never any drops in framerate and the load times are small, while the soundtrack and voices are typical of Mario. Finally we have a Mario Party game worthy of the name as Super Mario Party goes back to its roots, but also takes a few risks that have mixed results. Still, its such a huge improvement over the mess of Mario Party 10 that I can overlook them and say that this is a must for any Switch owner.